BACO © 2007 BACO S.à.r.l. 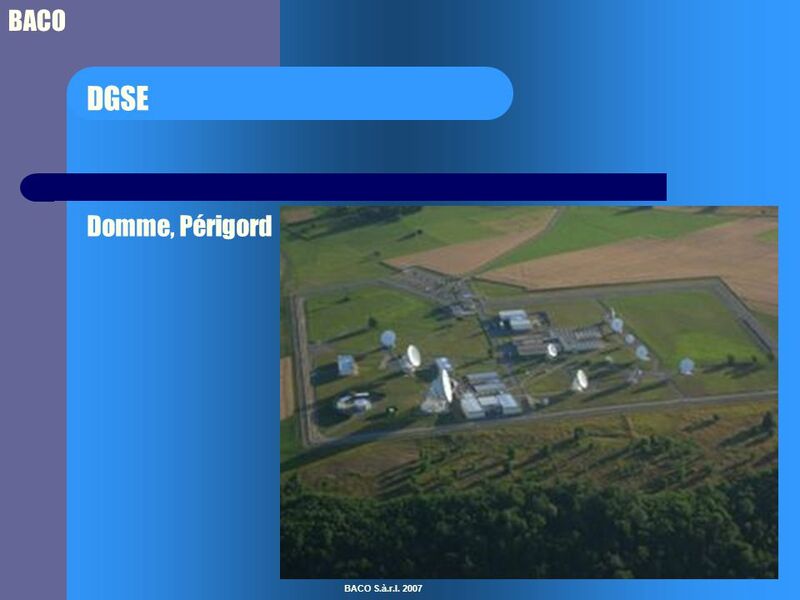 Information Warfare The operational need for national cryptology solutions – a user‘s view BACO S.à.r.l. 46, rue de l‘Hôpital. 3 BACO BACO S.à.r.l. 2007 What do we talk about ? 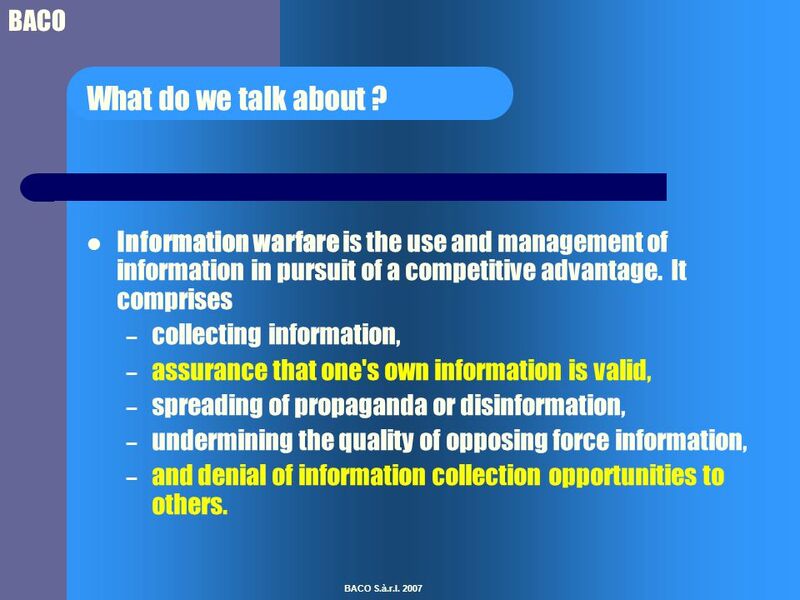 Information warfare is the use and management of information in pursuit of a competitive advantage. 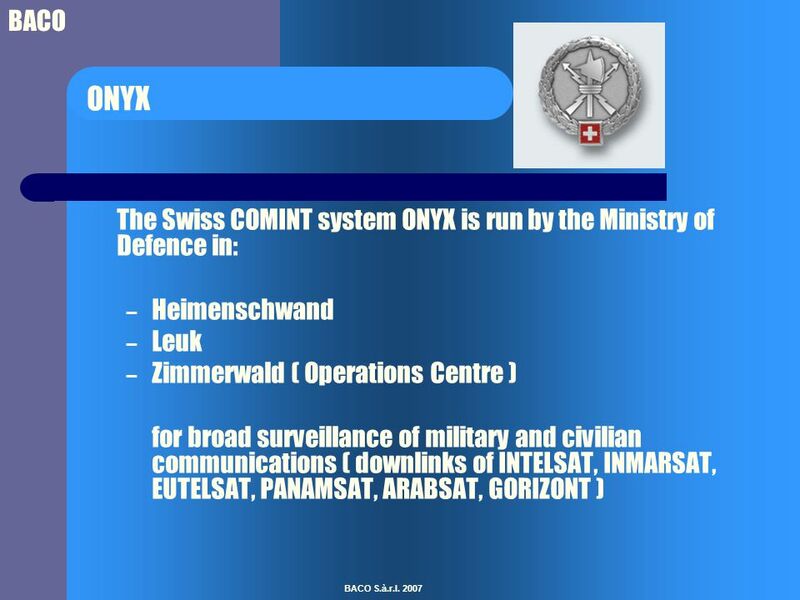 It comprises – collecting information, – assurance that one's own information is valid, – spreading of propaganda or disinformation, – undermining the quality of opposing force information, – and denial of information collection opportunities to others. 5 BACO BACO S.à.r.l. 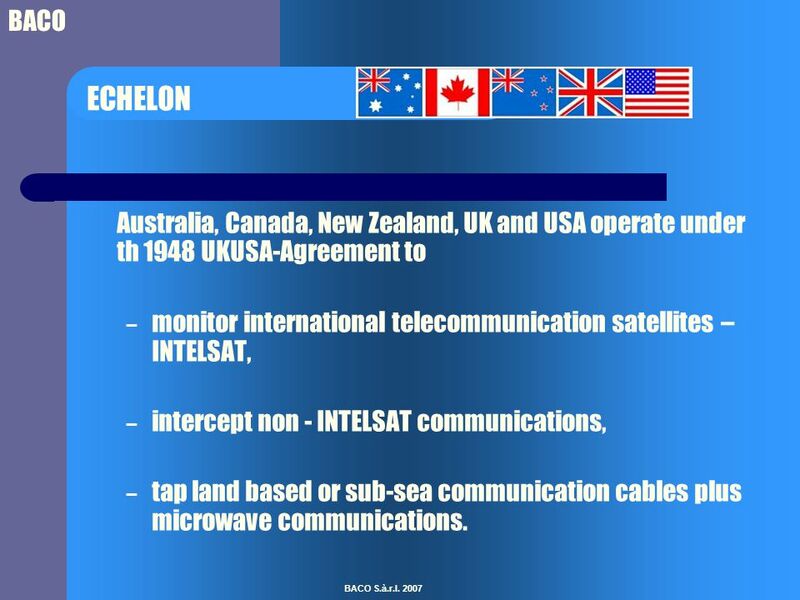 2007 ECHELON Australia, Canada, New Zealand, UK and USA operate under th 1948 UKUSA-Agreement to – monitor international telecommunication satellites – INTELSAT, – intercept non - INTELSAT communications, – tap land based or sub-sea communication cables plus microwave communications. 16 BACO BACO S.à.r.l. 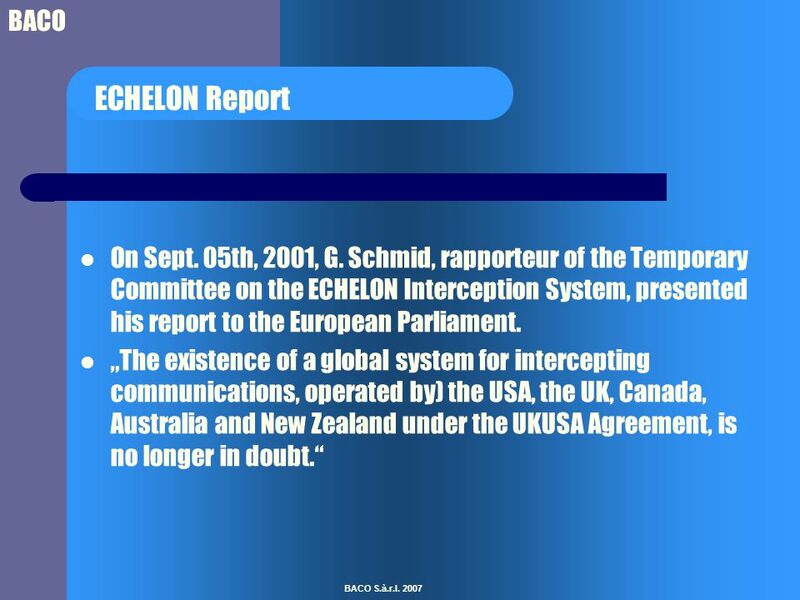 2007 The Solution To protect information we need national cryptology solutions not under control of the “big spy nations”. Is this really the solution ? If yes, how far ? 17 BACO BACO S.à.r.l. 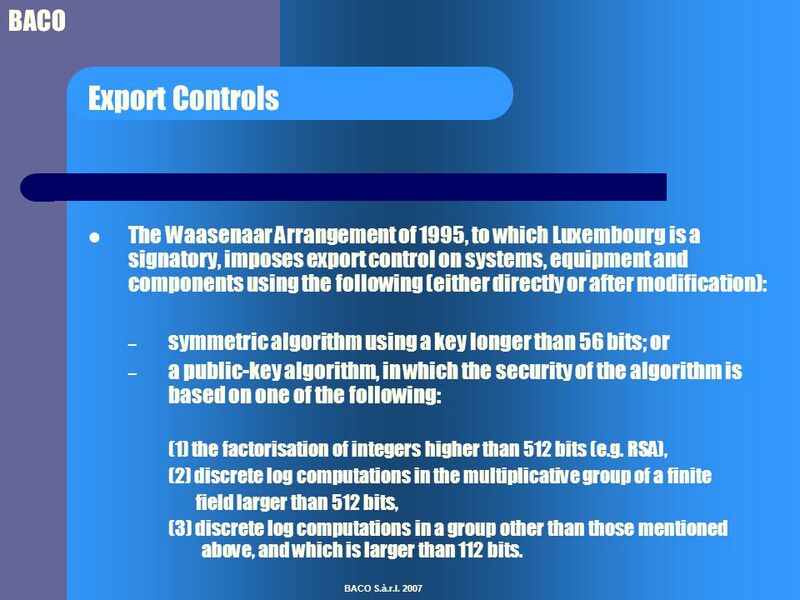 2007 Export Controls The Waasenaar Arrangement of 1995, to which Luxembourg is a signatory, imposes export control on systems, equipment and components using the following (either directly or after modification): – symmetric algorithm using a key longer than 56 bits; or – a public-key algorithm, in which the security of the algorithm is based on one of the following: (1) the factorisation of integers higher than 512 bits (e.g. RSA), (2) discrete log computations in the multiplicative group of a finite field larger than 512 bits, (3) discrete log computations in a group other than those mentioned above, and which is larger than 112 bits. 18 BACO BACO S.à.r.l. 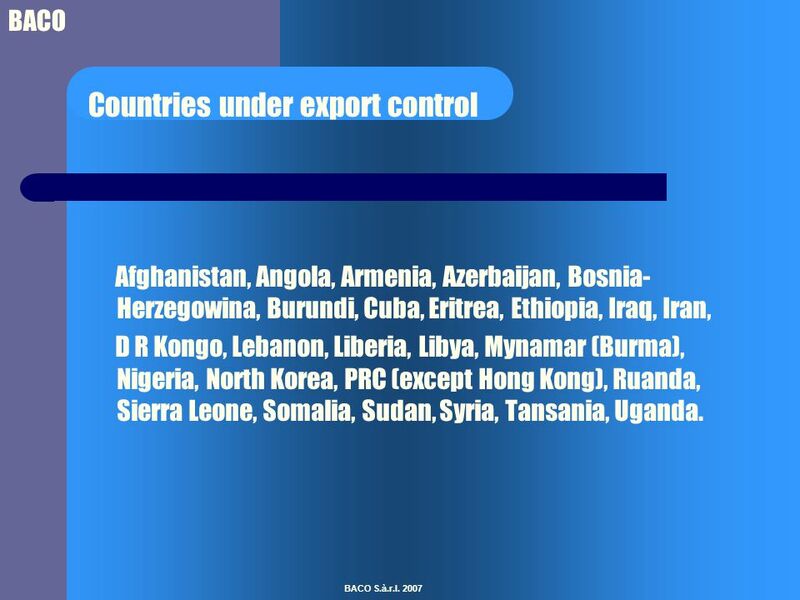 2007 Countries under export control Afghanistan, Angola, Armenia, Azerbaijan, Bosnia- Herzegowina, Burundi, Cuba, Eritrea, Ethiopia, Iraq, Iran, D R Kongo, Lebanon, Liberia, Libya, Mynamar (Burma), Nigeria, North Korea, PRC (except Hong Kong), Ruanda, Sierra Leone, Somalia, Sudan, Syria, Tansania, Uganda. 20 BACO BACO S.à.r.l. 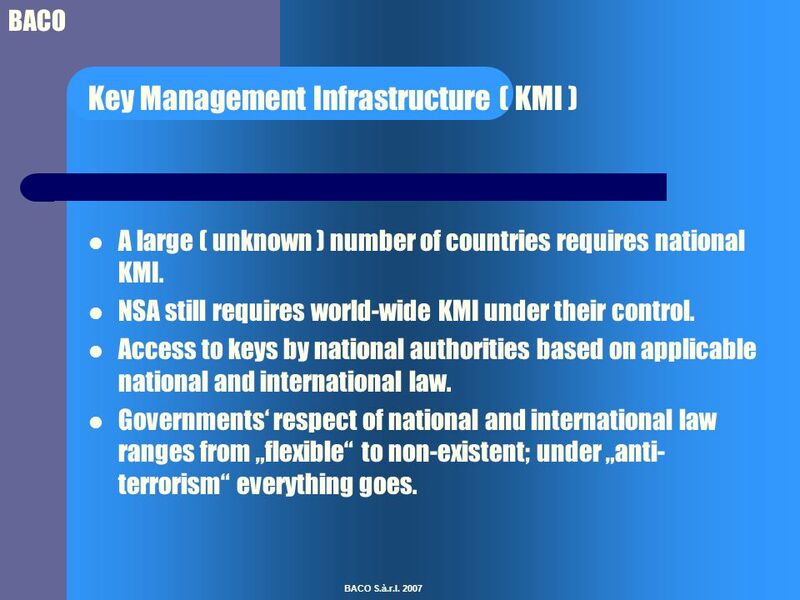 2007 Key Management Infrastructure ( KMI ) A large ( unknown ) number of countries requires national KMI. 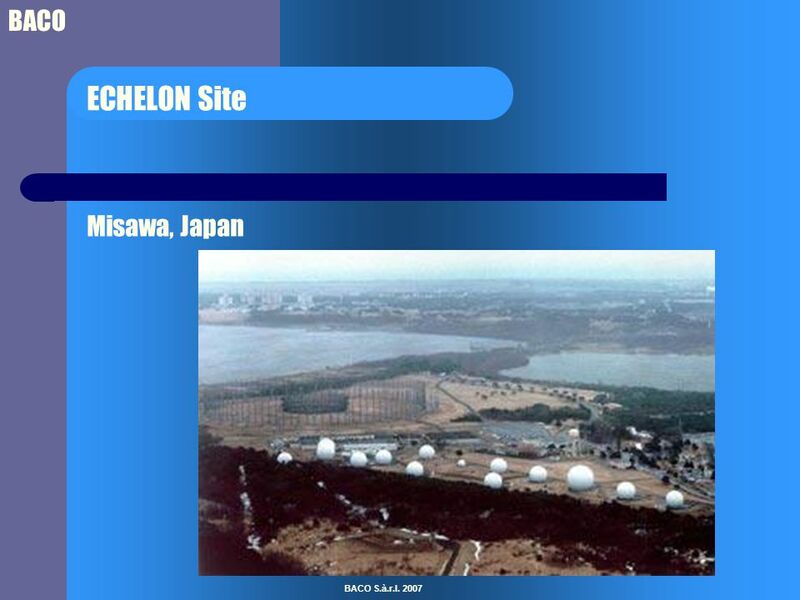 NSA still requires world-wide KMI under their control. 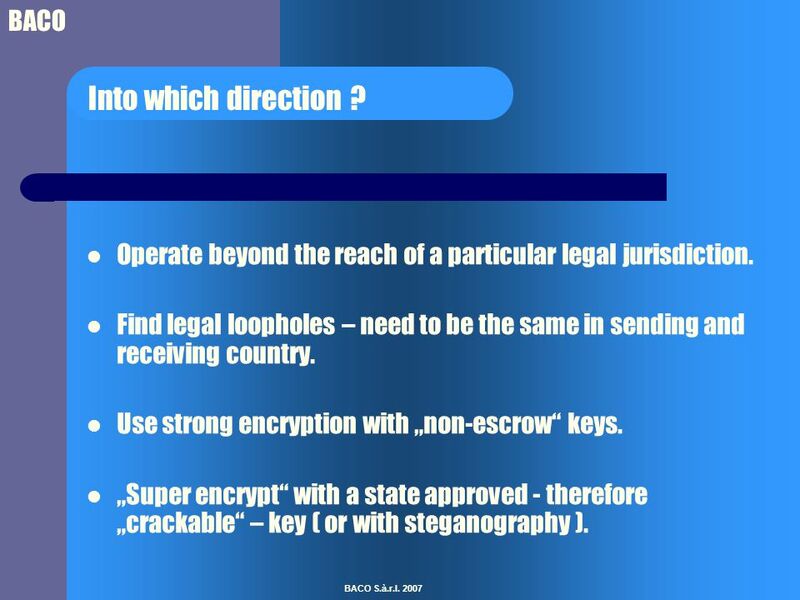 Access to keys by national authorities based on applicable national and international law. Governments‘ respect of national and international law ranges from „flexible“ to non-existent; under „anti- terrorism“ everything goes. 21 BACO BACO S.à.r.l. 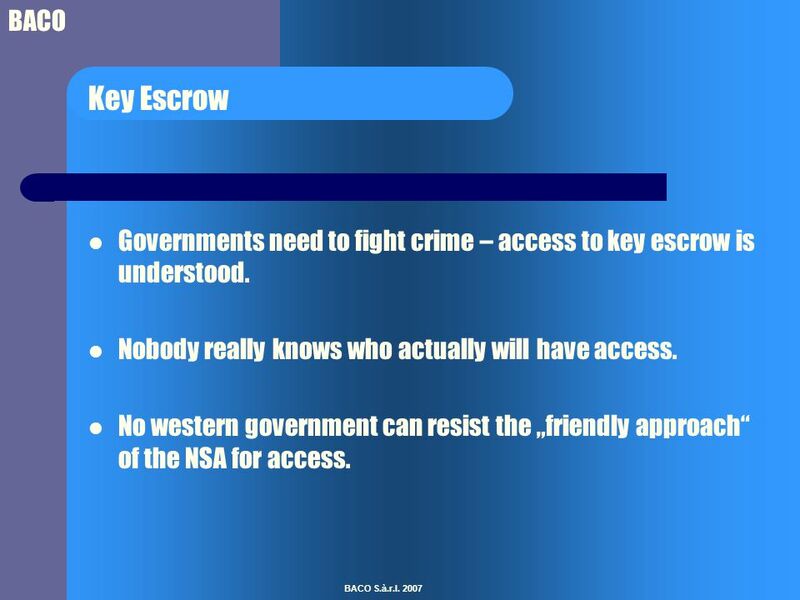 2007 Key Escrow Governments need to fight crime – access to key escrow is understood. Nobody really knows who actually will have access. 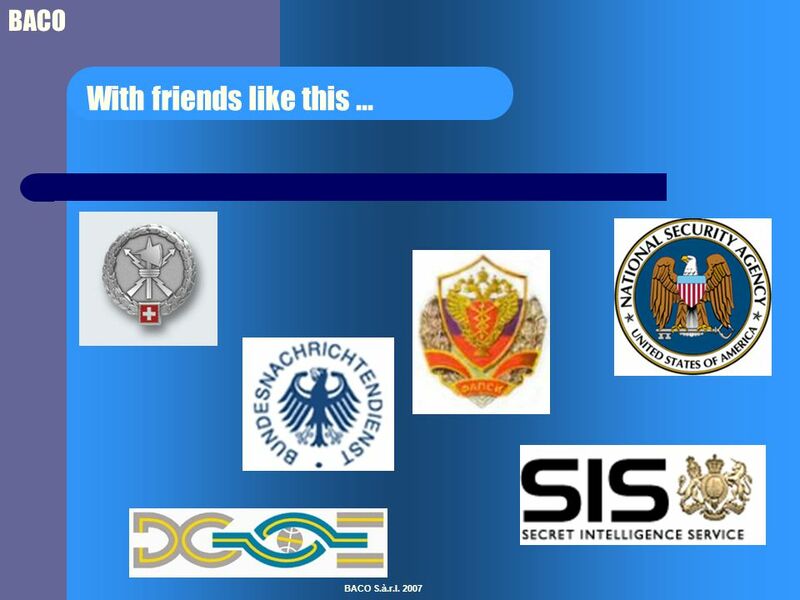 No western government can resist the „friendly approach“ of the NSA for access. 24 BACO BACO S.à.r.l. 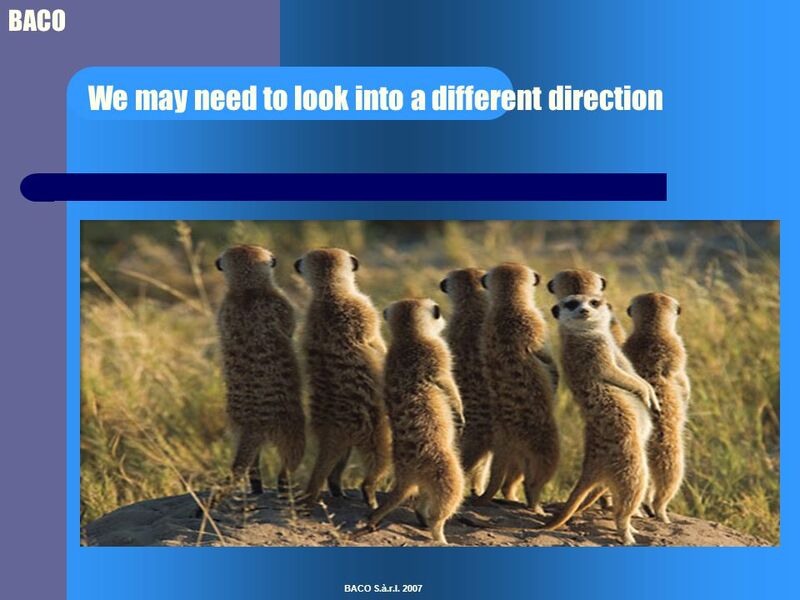 2007 Into which direction ? Operate beyond the reach of a particular legal jurisdiction. Find legal loopholes – need to be the same in sending and receiving country. Use strong encryption with „non-escrow“ keys. 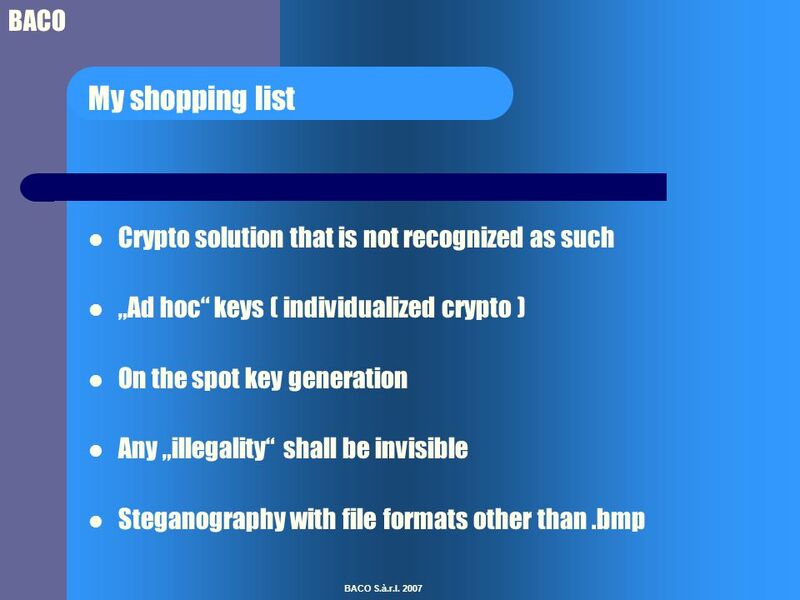 „Super encrypt“ with a state approved - therefore „crackable“ – key ( or with steganography ). 25 BACO BACO S.à.r.l. 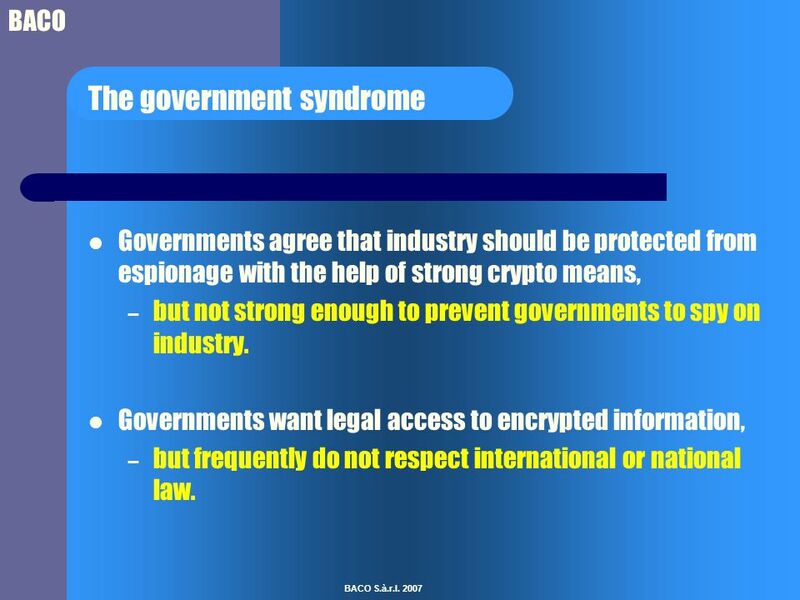 2007 The government syndrome Governments agree that industry should be protected from espionage with the help of strong crypto means, – but not strong enough to prevent governments to spy on industry. Governments want legal access to encrypted information, – but frequently do not respect international or national law. 26 BACO BACO S.à.r.l. 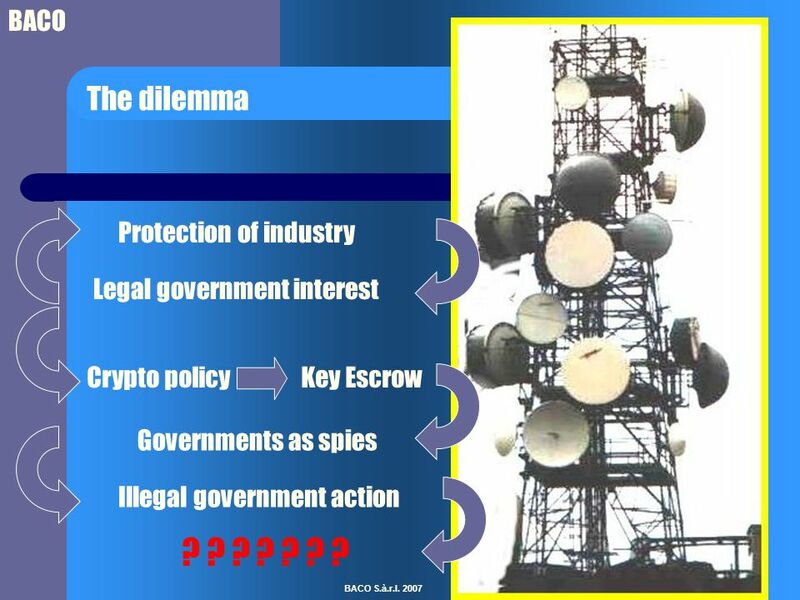 2007 The dilemma Legal government interest Crypto policyKey Escrow Governments as spies Illegal government action Protection of industry ? ? ? ? ? ? ? 27 BACO BACO S.à.r.l. 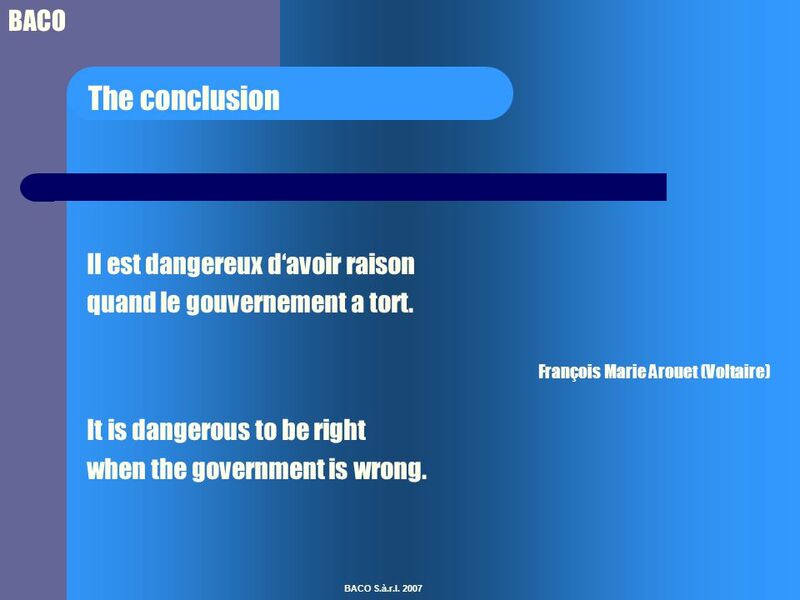 2007 The conclusion Il est dangereux d‘avoir raison quand le gouvernement a tort. François Marie Arouet (Voltaire) It is dangerous to be right when the government is wrong. Download ppt "BACO © 2007 BACO S.à.r.l. 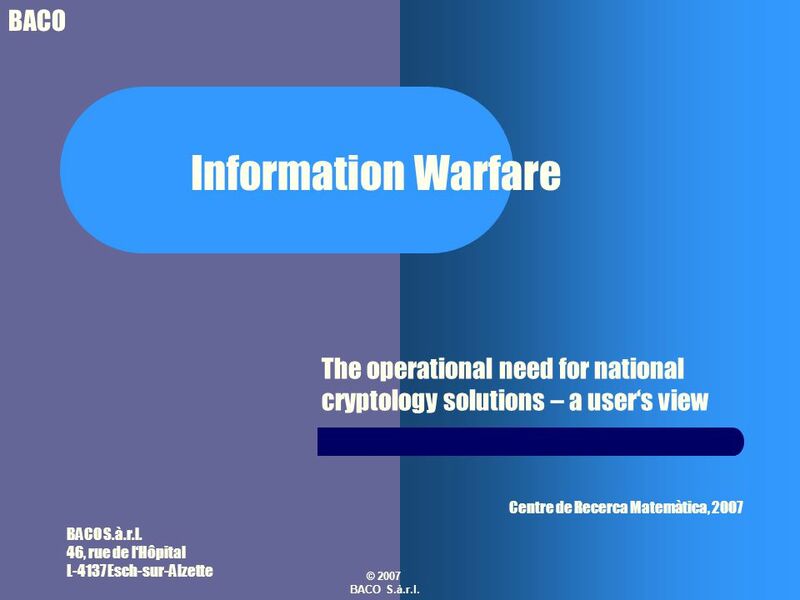 Information Warfare The operational need for national cryptology solutions – a user‘s view BACO S.à.r.l. 46, rue de l‘Hôpital." 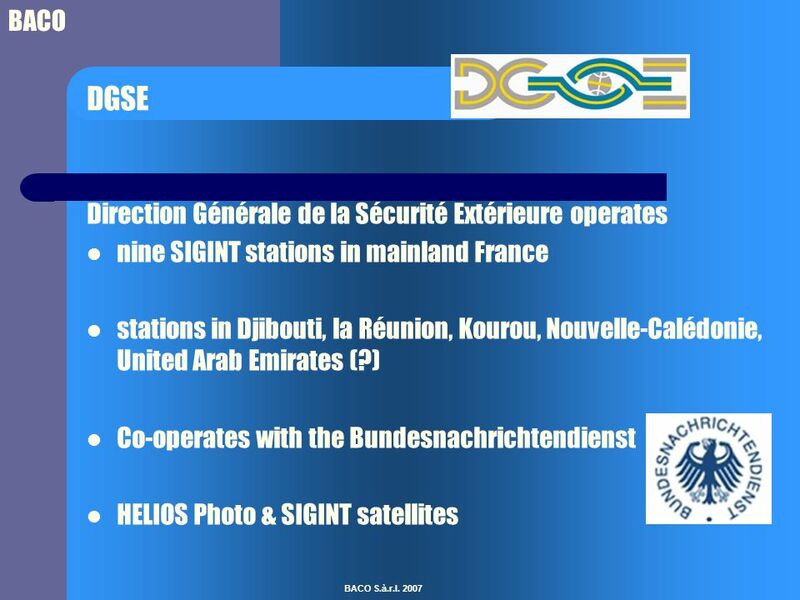 DIRECTORATE GENERAL FOR INTERNAL POLICIES Justice, Freedom & Security National Programmes for Mass Surveillance in EU Member States and Compatibility with. SCOLA. SCOLA is a content acquirer/provider. SCOLA is a content acquirer/provider. 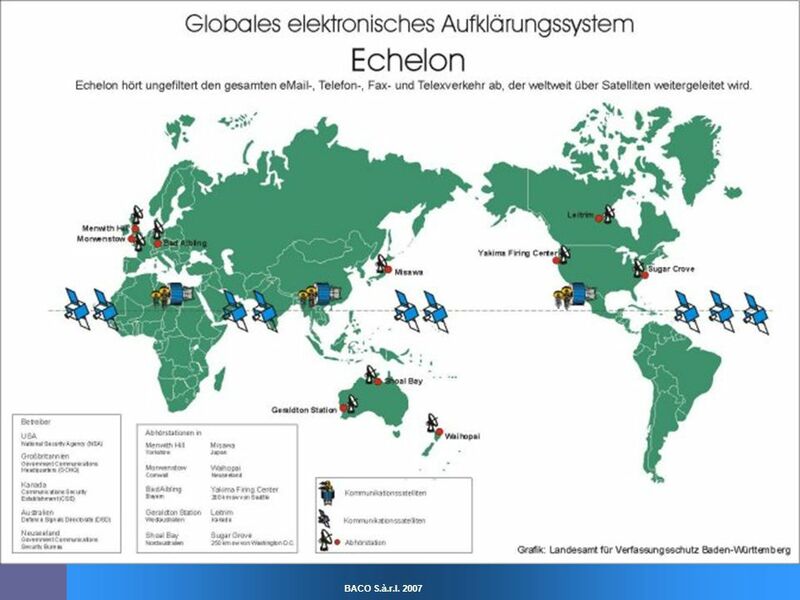 We import and re-transmit electronic and hard media from 105 countries. Presented by: Sheryl Trexler, Export Compliance Officer Office of Research Integrity & Compliance (ORIC) Date: September 2011. Copyright © 2009 South-Western Legal Studies in Business, a part of South-Western Cengage Learning. CHAPTER 13 The Regulation of Exports. Current ıssues ın ınternatıonal relatıons. NUCLEAR ENERGY AND NUCLEAR PROLIFERATION OF IRAN. 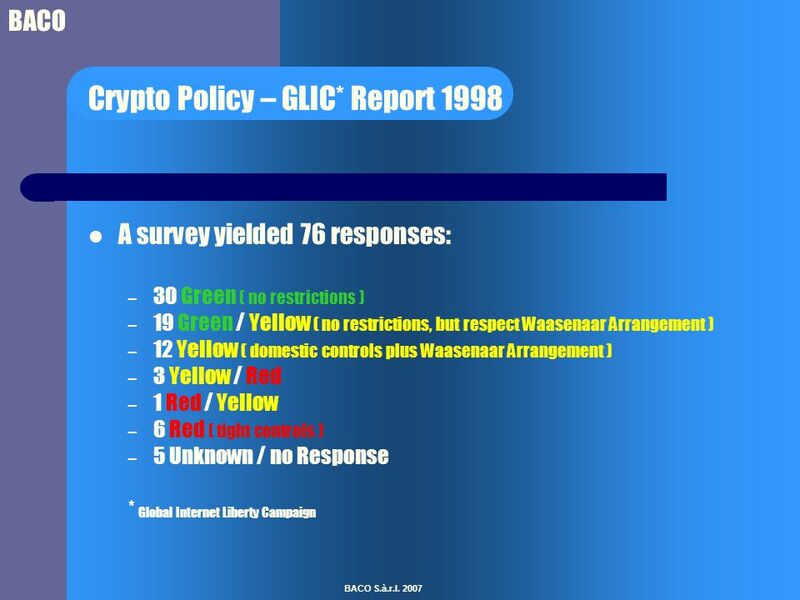 A Gift of Fire, 2edChapter 3: Encryption and Interception of Communications1 PowerPoint ® Slides to Accompany A Gift of Fire : Social, Legal, and Ethical. 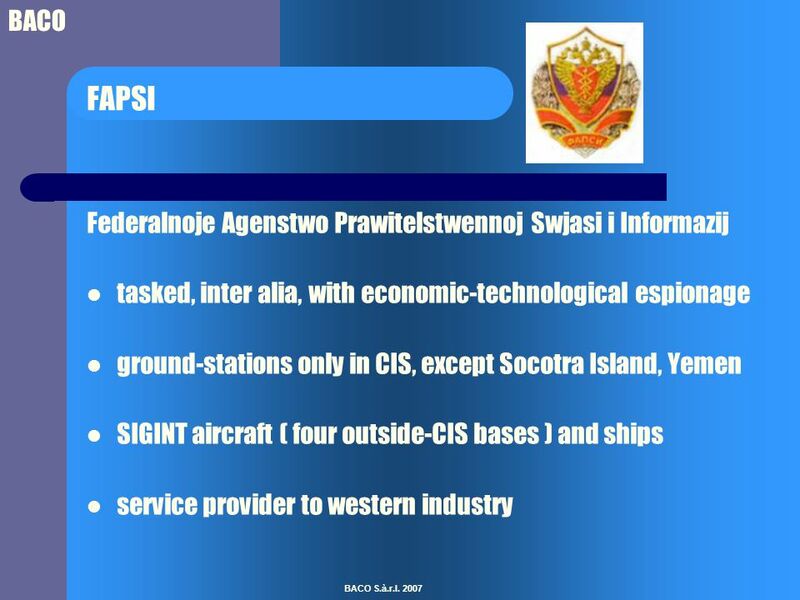 Encryption and Interception of Communications Presented by: Emmanuel Sotelo Sassja Ceballos Chapter 3. 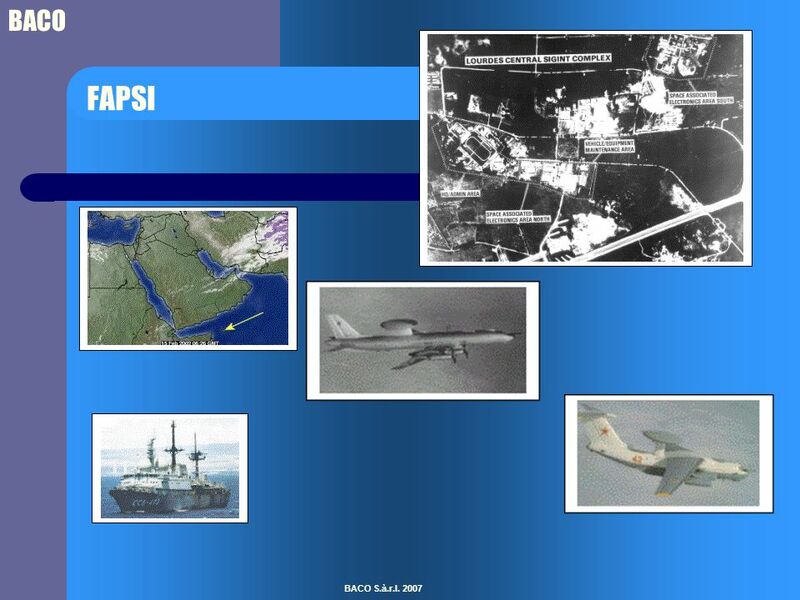 Canada’s International Relationships Unit 5 – Global Systems Lesson 25 – Canada’s International Relationships. 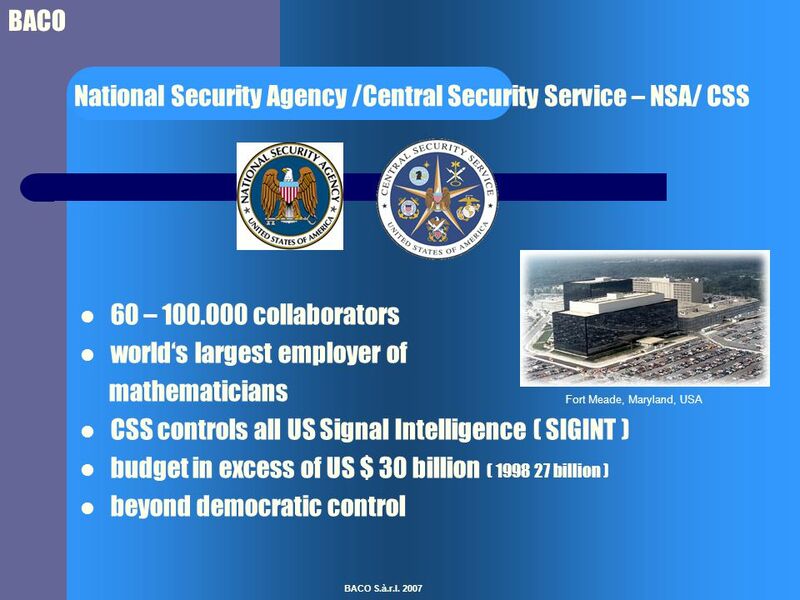 [[ NET-CENTRIC CAPABILITIES TURBULENCE TECHNICAL OVERVIEW : AUGUST 2007 ]] MATH CAREERS AT NATIONAL SECURITY AGENCY Jill Calhoun May 2010. Canada ’ s Foreign Policy. Economic Sanctions Canadian Economic Sanctions – The imposition of economic sanctions against foreign States and non-State. Strangers Next Door: Migration, Immigration, and Mission J. D. Payne. Is the EU and will it ever be a Defence Alliance? Alyson JK Bailes Faculty of Political Science. Human Rights and Asia Lindy Stirling Contemporary Issues. MONITORING AND COUNTERING THE ILLICIT ARMS TRADE.